This Choral Leatherette Folio features a 1" spine, rounded bottom pockets, reinforced brass corners, and a pencil loop. It is handcrafted from high quality leatherette. All seams and edges are leatherette finished.Deer River Leatherette Folios are manufactured for years of constant use with evident quality, durability and strength. 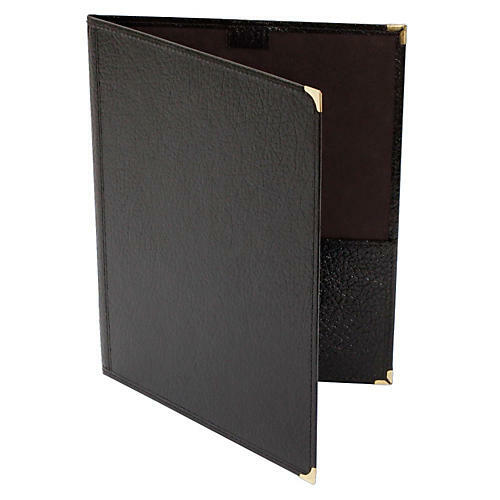 This Choral Leatherette Folio features a 1" spine, rounded bottom pockets, reinforced brass corners, and a pencil loop. It is handcrafted from high quality leatherette. All seams and edges are leatherette finished. Deer River Leatherette Folios are manufactured for years of constant use with evident quality, durability and strength.